Made after San Francisco earthquake and fire of April 18th, 1906. 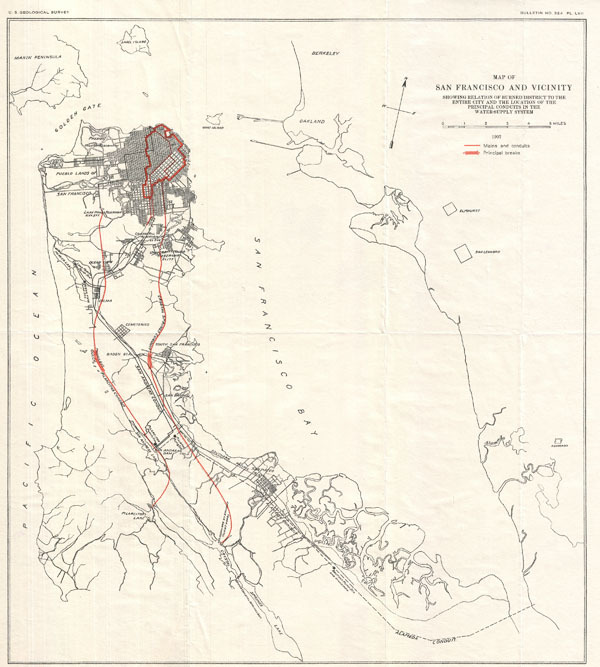 Map of San Francisco and Vicinity Showing Relation of Burned District to the Entire City and the Location of the Principal Conduits in the Water-Suppy System. An unusual map of San Francisco Peninsula and part of San Francisco Bay dating to 1907. This map was published by the U.S. Geological Survey following the terrible San Francisco Earthquake and Fire of 1806. This natural disaster, comparable to the devastation wrought by Hurricane Katrina, is considered the largest is California History. This map highlights the developed parts of San Francisco most damaged by the fire in red ink. It also shows the water conduits that supply the city. Published in the U.S. Geological Survey's 1907 report on the San Francisco Earthquake and Fire. Humphrey, R. L., The San Francisco Earthquake and Fire of April 18, 1906, U. S. Geological Survey, 1907. Very good condition. Original foldlines. Else clean.